ORDER VI.—WORKERS IN CHEMICAL PROCESSES; MAKERS OF PAINTS, OILS, ETC. Sub-order 2.—Makers of Paints, Oils (not Mineral), etc. assists polish foreman q.v. ; checks mixing of ingredients and gives directions to labourers in boot, floor, etc., polish factory. in charge of mixing department of factory where laundry bine is made; supervises work of weighing out and mixing of components. superintends all processes in making of edible and non-edible fats, sorting of bones, etc. ; bleaches melted fat by stirring it and adding sulphuric acid and alkaline permanganate to precipitate impurities. attends to storage of refined oil, and superintends men engaged thereon, and cleaning, etc., of tanks. supervises making of boot, floor, furniture, etc., polish, and is in charge of workers engaged thereon; allocates duties, maintains discipline, engages and discharges workers; determines ingredients and supervises weighing and mixing of them under instructions of chemist. 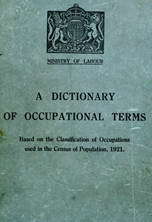 a foreman in charge of works or part of works in which varnish is made; is in charge of men employed; gives orders as to processes to be carried out, and is responsible to works manager for quality of varnish made. general term for man in charge of a process or processes in paint or colour manufacture; gives instructions as to quantities to be mixed or ground, as to fineness of grinding required, etc. a foreman in charge of a shift or spell in seed crushing, oil expressing, and cake-making plant; supervises proper working of conveyors, crushing rolls, hydraulic presses, etc. ; allocates duties, maintains discipline, authorises pay sheets.